"It's like all of your worst fears in one house! " "it was absoloutley terrifying. me my dad and my sister went through and i was so scared!but i didnt chicken out!" "Way scarier than Canada's Wonderland! One of my friends peed her pants! Would definitely recommend Nightmares Fear Factory for anyone who thinks they don't get scared in haunted houses. " "Hahaha such a fun and scary experience!! Went back the next night to see if our picture would be less 'freaky'...nope still just as scared..haha have four pictures at home now. I can't wait to go back and visit the family just to do it again :) best haunted house everr!" "BEST HAUNTED HOUSE I HAVE EVER BEEN TOO ! if you haven't been in it, I highly recommend it. I went in yesterday with my friend. how on earth was she so calm. honestly I thought I was going to die at one point. Oh my god, the best part was when they ******* and then they *********. But this haunted house isn't for the light hearted, because it'll make your heart beat so fast till it thunders out of your chest. " "So scary the whole way through my mom death griped me don't do it :("
"AMAZING, Never have I been so scared and amazed by some of the scares in that factory, don't dare go alone, they're waiting for you.. Good luck." "Best Haunted House I've ever been to. I wanted to take my gf to one for her birthday and having already tried every other one in Niagara, I decided to go for this one. I expected my gf to be really scared while I cruised along but I was just as scared as she was. its REALLY scary. we survived but we're never going back. definitely try it out if you think you can handle it"
"I'm surprised I got through it! Even the waiting area gives you chills...especially when you hear the screaming from inside! I'm sure I made my boyfriends ear bleed at some point with all my screaming and I was screaming every other second in there Lol. A freakishly realistic and down right creepy surprise at EVERY corner! Coming from one scary girl ; I highly recommend this haunted house. Don't chicken out! They save the best suprises for last and its all worth it when your one of the VERY FEW holding a survivor card ;)"
"BEST haunted house we've ever been to! We were scared to death! we almost broke our wrists cause we held onto eachother so tight! lol. i cried like a little girl"
"I went in expecting the same old garbage from every other haunted house in niagara, fun, but garbage. Instead I shat my pants. Literally. Thanks alot jerks. I'm joking the actors are amazing and they take real pride in keeping their title of best haunted house in the world." "This place is AWESOME! I love scary movies, haunted houses, and anything that will terrify me. This definitely did not disappoint. 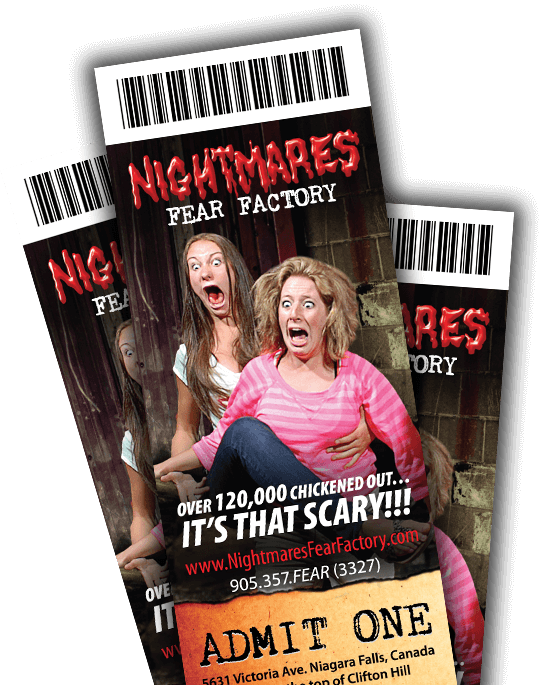 I highly recommend Nightmares Fear Factory to anyone visiting Niagara Falls-- or even if you aren't. Just a small hint of advice: be ready to be scared out of your freaking mind! Oh, and don't mention your name once inside. Or, if you're brave, do. Find out what happens. " Some have been left by survivors of this haunted Niagara Falls Canada attraction, others stories are from those who weren't able to make it all the way through and chickened out. You've read their stories of terror. Now tell your story! or visit for the first time.